Energy security and independence have moved higher on the agenda in Ukraine since Russia launched its war in the Donbass four years ago. Before 2014, Ukraine relied heavily on Russia as a gas supplier. But the war and the annexation of Crimea has turned Ukraine away from Moscow and toward friendlier, but pricier suppliers, like Hungary and Poland. Ukraine hasn’t imported any gas from Russia for its own needs for more than two and-half years now. However, it still imports Russian gas that it transits on to Russian gas company Gazprom’s customers to the west. Now the construction of Nord Stream 2 — a pipeline that will transport gas from Russia to Germany via the Baltic Sea — has raised doubts about Ukraine’s continued status as a major transit country for Russian gas, which in turn raises doubts about its energy security. To some the answer is clear: bolster renewable energy. While the share of energy Ukraine gets from renewable sources is still quite low, at 1.2 percent in 2017 (2.086 million kilowatts), the market is growing rapidly. Optimistic forecasts see Ukraine obtaining nearly all of its power from renewable sources by mid-century. But this “revolutionary scenario” would require significant investment and development of infrastructure. Ukraine’s current energy generation mix is heavily tilted to fossil fuel and nuclear, with coal- and gas-fired power plants and nuclear power accounting for up to 92 percent of the energy generated. But that mix has been changing — slowly. Since 2014, $550 million has been invested in Ukrainian renewables, according to Ukraine’s National Investment Council. 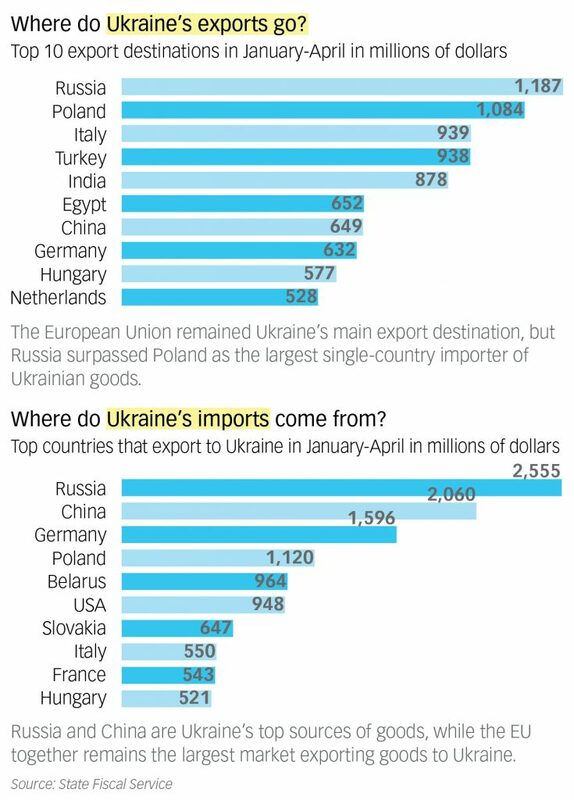 That’s a fraction of what Ukraine’s neighbors have invested over the same amount of time. Hungary, not known for its green policies, pumped $649 million into renewables in 2017 alone. 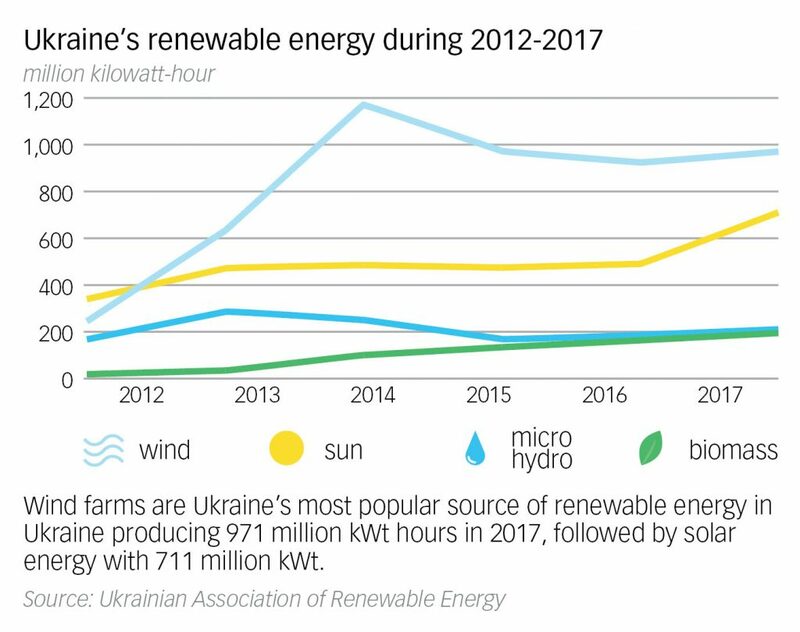 All the same, Ukraine’s renewable sector is growing fast: Renewable production tripled from 2012 to 2017, according to Ukrainian Association of Renewable Energy. One reason for this is that renewables are a good business in Ukraine, say proponents. “It’s an absolutely transparent business, which can bring project payback in one to six years,” said Yuriy Podolyak, the commercial director of IK NET. Another reason is Ukraine’s green tariff system, set up in 2009, which offers a higher rate to producers of renewable energy on Ukraine’s national energy market — a rate that’s fixed for a producer when they enter the market. Add to that other favorable factors, such as Ukraine’s large land area and climate, good for both wind and solar power plants, and there are ideal conditions for the renewable energy market to develop. “A renewable market is not just a cool thing to have,” Mats Lundin, acting chairman of the European-Ukrainian Energy Agency and founder of wind-power company Vindkraft Ukraina. “If you look worldwide today, the renewable market is the only (part of the energy market) that is really developing.” Lundin says non-nuclear renewables will soon be Ukraine’s cheapest energy option, given the social costs of coal power. “The cost for society to keep coal-fired power plants will be much more expensive than simply going for renewables. So, it’s better to close (coal-fired power plants) and start building more renewables,” he said. Research by Ukraine’s National Academy of Sciences suggests that, with proper investment, 90 percent of Ukraine’s energy could come from renewables. What sources of renewable energy will prove the most profitable, however, is a different question. The constant, steady winds in the south of Ukraine makes wind-power prospects there good. Wind energy accounted for 47 percent of Ukraine’s renewable electricity generation last year, or 970.5 million kWh. Sixty-five percent of that energy was generated by a single company – DTEK. The company operates the biggest wind power station in Ukraine — Botievo Wind Farm in Zaporizhzhya Oblast, with a capacity of 200 megawatts. That capacity will soon double, as DTEK has partnered with General Electric to build a second plant in Zaporizhzhya Oblast. The first stage of construction, a $150 million investment, is projected to be completed in 2019. After wind comes solar power, accounting for 35 percent of Ukraine’s renewable electricity production in 2017–710.7 million kWh. Just recently Ukrainian solar power company UDP Renewables announced a large-scale partnership with the Spanish company Acciona Energia Global, a global leader in green generation. The plan is to operate a solar plant with an annual capacity of 57.6 megawatts in Kyiv Oblast. “We plan to reach a capacity portfolio of 100 megawatts in January 2019,” said Sergiy Yevtushenko, managing partner of UDP Renewables. Another large foreign company interested in solar power investments in Ukraine is TIU Canada, which last year built a 10.5 megawatt station in the city of Nikopol in Dnipropetrovsk Oblast. “Now we’re planning about four more projects in Ukraine,” said Valentyna Beliakova, director TIU Canada. After wind and solar power comes biogas, accounting for 194.8 megawatts of Ukraine’s power generation capacity. Biogas is most effective at a smaller scale: 1 megawatt, says Yuriy Epstein, director of the consulting company Accord. His opinion is that biogas projects are the most attractive long term, as they don’t depend on weather conditions and produce fertilizers for the agricultural sector. Ukraine’s green tariff promises profits, but the country’s business climate remains less than welcoming owing to shifting legislation and sparse credit options in the country. On the legislative side, a new draft law in the Verkhovna Rada proposes that, from July 1 next year, new solar power plants over 10 megawatts and wind projects over 20 megawatts will have to sell their power at auctions, as opposed to benefitting from the green tariff. Though such auctions have been successful in other countries, investors said this law, as well as other changes to the legislation, makes planning their business difficult. “Investors always look for a certain amount of stability in order to predict their actions for a long time. But in Ukraine it’s a never ending process. The Ukrainian market can change for various unpredictable reasons,” said Lundin. “We have just started work with the green tariff, and now they’re cutting it off and changing the rules of the game for investors,” said Beliakova. Lundin says the idea of switching to auctions for green energy arose because of the great interest in renewable energy projects. But he cautions that such auctions have failed elsewhere. “Look at the Turkish market… because the tariff is so low, (investors) will have to sit and wait for 5 to 10 years before equipment is cheap enough (for their costs) to match the tariff,” said Lundin. Another risk is the perennially shaky financial market in Ukraine, where banks will rarely give long-term credit, and, if they do, provide it at interest rates from three to four percent higher than in Europe. Investors who fail to get a loan from Ukrgasbank, Oschadbank, or other such Ukrainian banks will have to go to the European Bank for Reconstruction and Development for credit.